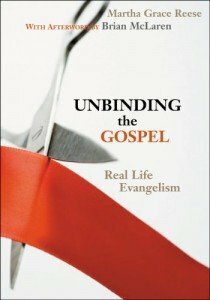 I attended Martha Reese’s workshop (author of Unbinding the Gospel: Real Life Evangelism (Real Life Evangelism Series) at the Evangelism Conference in Nashville. I was going to do my own write up, but the Presbyterian News Service beat me to it. Reese, who interviewed 600-700 pastors, said key leaders in churches doing good evangelism are holding their members to a sharp focus on their growing relationships with Christ and sharing their faith with others. “What the great churches are doing, that are really doing all different kinds of evangelism, they’re sharing their own faith stories,” Reese said. What I appreciated about the workshop was that we had the chance to pray with other folks around the table. We didn’t just stay strangers during the workshop, but instead got to pray with two or three others about God’s activity in their life and to pray together about some personal needs. Reese constantly stressed that folks need to be comfortable talking about the activity of God in their life and then gave us the space to share with the person sitting next to us. Are you comfortable talking about what God is doing in your life today that makes the gospel good news? What can you do in your small group to help members talk about their faith? How comfortable are you in asking “Can I pray for you” and doing it on the spot if given permission?